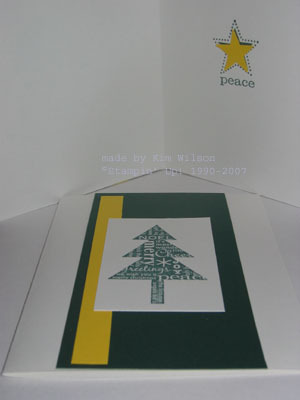 Here is an easy card that I designed for our MOMS group to make and send to our military for Christmas. Stamp Set: Perfect Presentation, Colors: YoYo Yellow and Handsome Hunter, Accessories: Star punch – this fits perfectly over the star in the peace set. This would be a great card for those of you that send lots of Christmas cards, or who are selling cards this season. TODAY IS THE LAST DAY to order Wishing You at 20% off. And don’t forget the Designer Paper Sale and my share for the PRINTS papers. All my specials are listed to the right. I am also taking reservations for my January through June Stamp Club. Contact me for details.